A delightful combination of light colors and lovely flowers, it's simply beautiful. 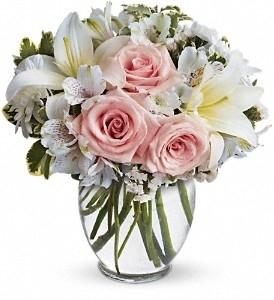 Light pink roses, white asiatic lilies, alstroemeria, cushion spray chrysanthemums and statice are delivered in a stylish vase. Style to spare!